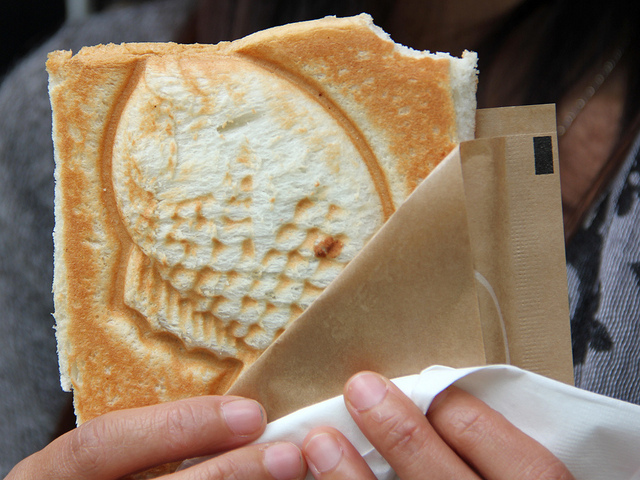 Seoul is a foodie kingdom. While there’s a tantalizing restaurant every few meters throughout the entire city, it’s street food carts and tents that fill all the open spaces. 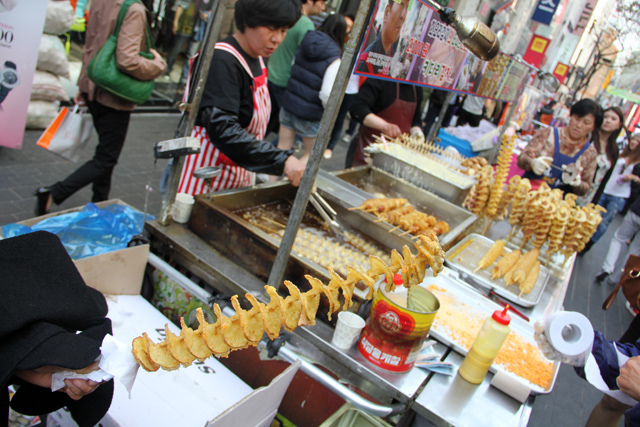 Walking through Seoul is like having to walk through a slot canyon of culinary goodies all calling your name. When I first arrived, I felt like an octopus, all of my tentacles screamed to eat a different delicacy in a different direction. 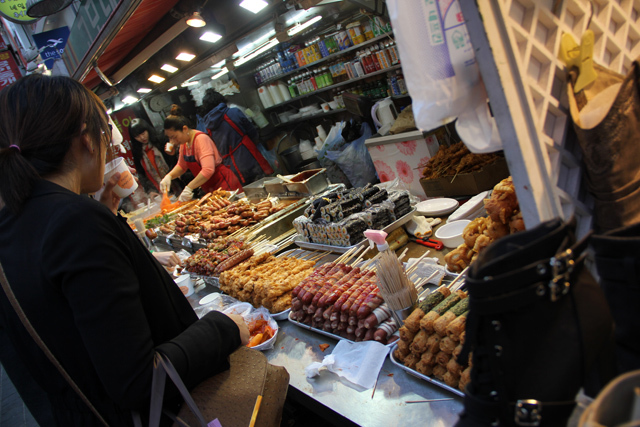 If you like to snack, you’ll have lots to do in South Korea! Unlike Bangkok street food where you can eat entire meals on the sidewalk, I found most Korean street food in Seoul to be more along the lines of snack material (I guess depending on how much you eat of course). 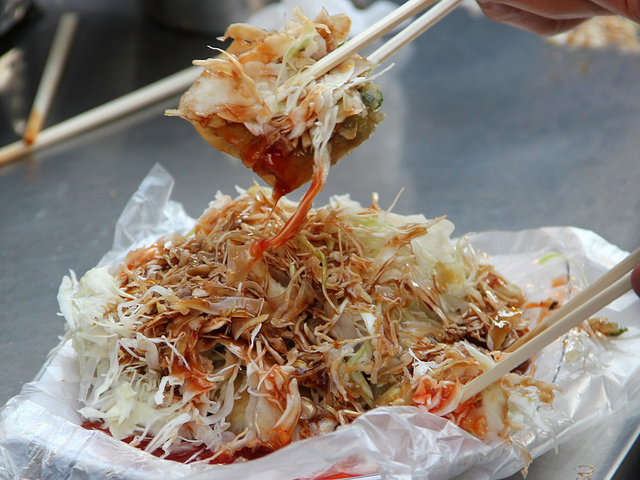 Instead of wolfing down bowls of rice and full dishes, Korean street food is often reserved for things that can be eaten standing up, especially catering to Seoulites that are running from subway to subway. Stuff on sticks or things can can be eaten with toothpicks are common. 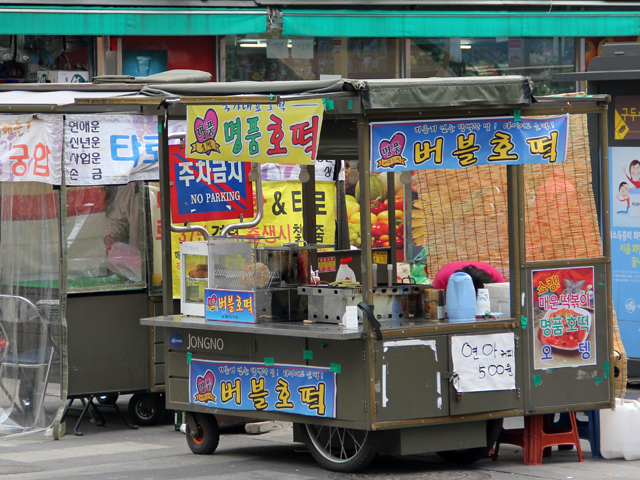 Korean street food carts are bulky and quite sturdy in design, kind of like boats of food on wheels. 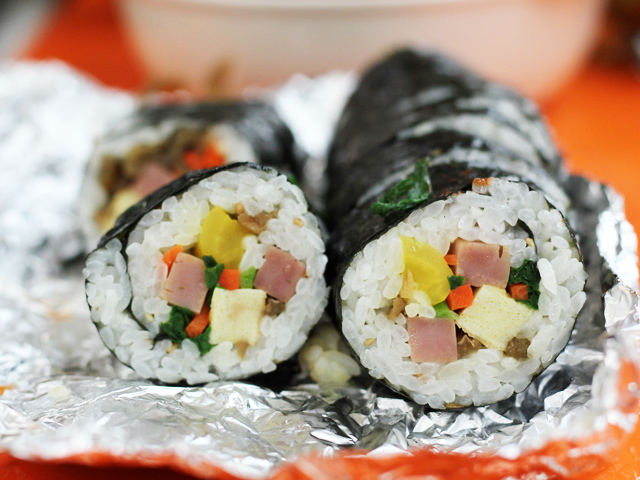 As a beloved South Korean food, you can be assured gimbap is available in restaurants and on the street too. Packed onto street carts, often accompanied by tteokbokki, gimbap begins with a sheet of seaweed that’s filled with rice, a few pickled veggies and a slice of egg. The street version is normally pre-made and wrapped in plastic to remain moist and soft. 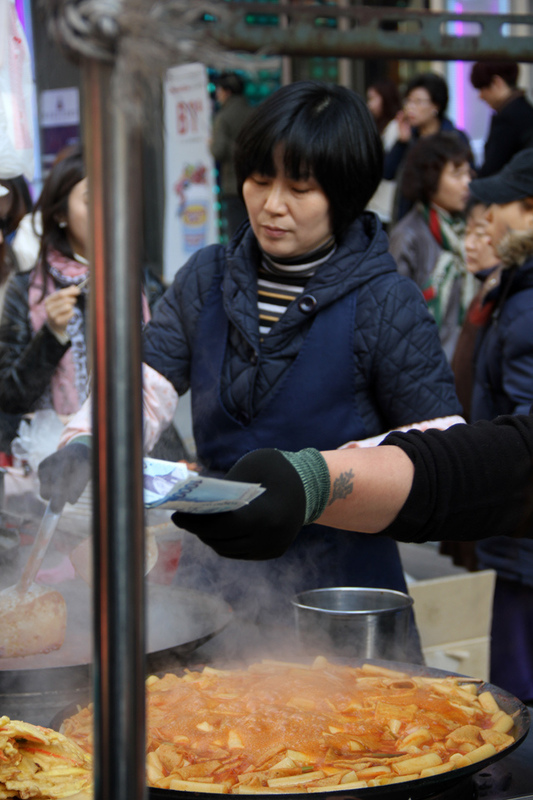 What I liked most about the street style gimbap was the toasted sesame seeds sprinkled on top! 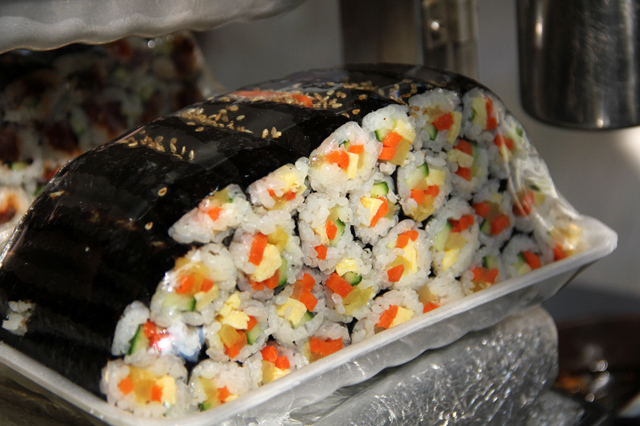 Here’s a shot of the restaurant or take-out version of gimbap. 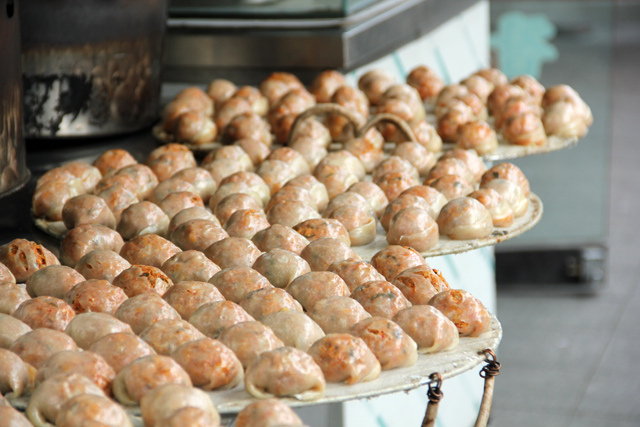 Korean mandu is eaten both in sit down restaurants and also on the street. These particular dumplings were resting in the warm outdoor air, just asking to be devoured. 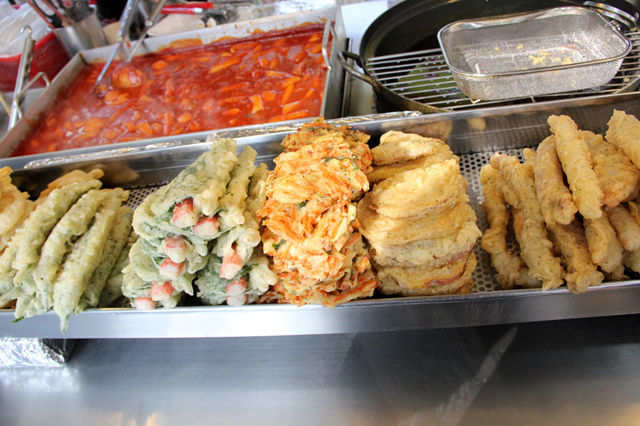 In Myeongdong, there’s no shortage of modern trendy and tasty street food treats to taste. This plate of deep fried dumplings was sliced with scissors, piled with sliced cabbage and drenched in tomato chili sauce and teriyaki sauce. 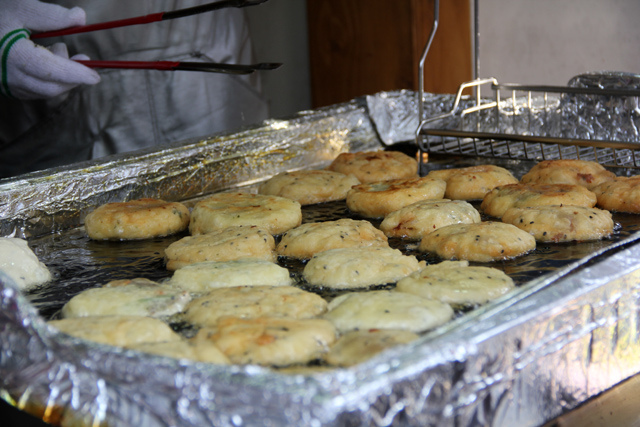 Deep frying is one of the world’s favorite street food cooking methods – crunchy, greasy, and packed full of tastiness. I don’t think there’s a culture in the world where deep frying is not present and Korea has lots of deep fried goodies. 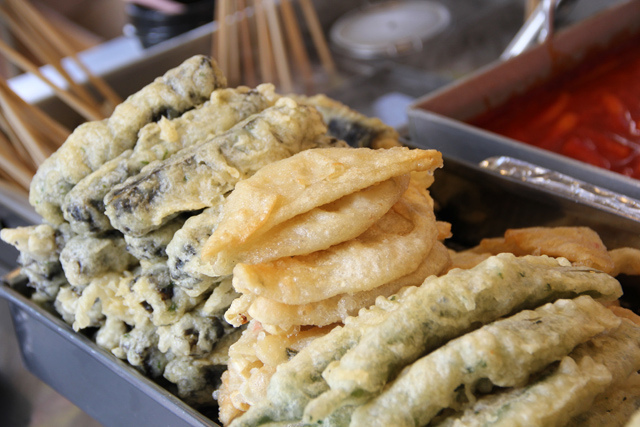 Very similar to Japanese tempura, Twigim is a greasy man’s favorite treat – slices of veggies fried and waiting on the side of the street to be ordered. Twigim goes great with a few beers! It seems the trendy shopping district of Myeondong, where some 2 million people visit per day, is kind of a Korean street food pioneer in testing out new delicious snacks. One of the popular items that kids and supermodels munch on the is the tornado potato. 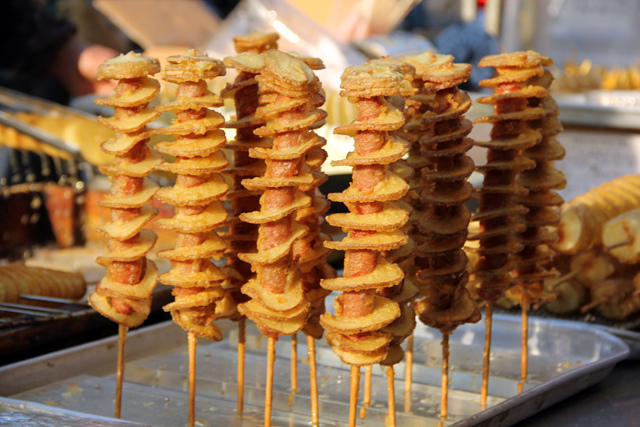 This impressive potato swirl is a potato cut into a spiral, spread out on a long stick, deep fried until crunchy and sprinkled with addictive MSG cheesy tasting powder. A Tornado Potato swirl is the marriage of French Fries and potato chips. These treats have made such a name for themselves that they’re even available in Bangkok. Do you enjoy the duo of hot dogs and French fries? 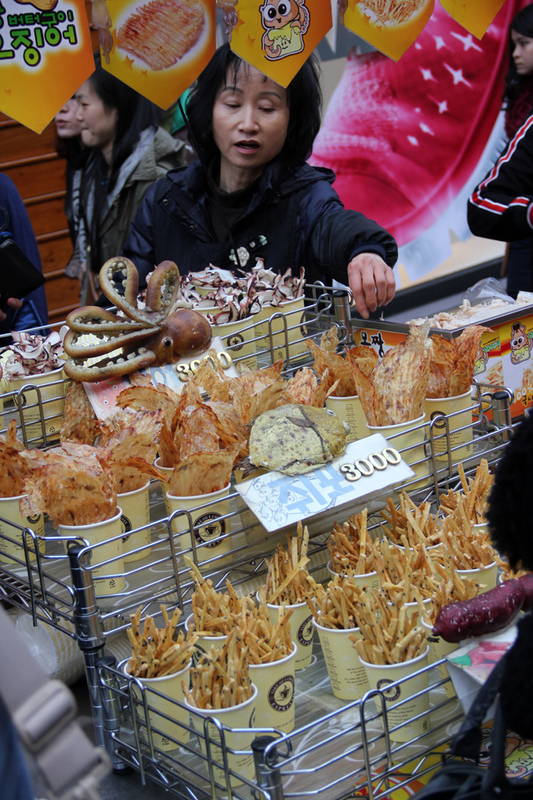 Well the South Korean street food scientists decided to wrap a hot dog in French fries and deep fry the entire thing. Though it looks more like a medieval war club, I can assure you that it’s much tastier. This snack was not designed for the health conscious. A long skinny hot dog wrapped with the same spiral cut potato, deep fried in the same oil, and served for only the purest deep fried fanatics. 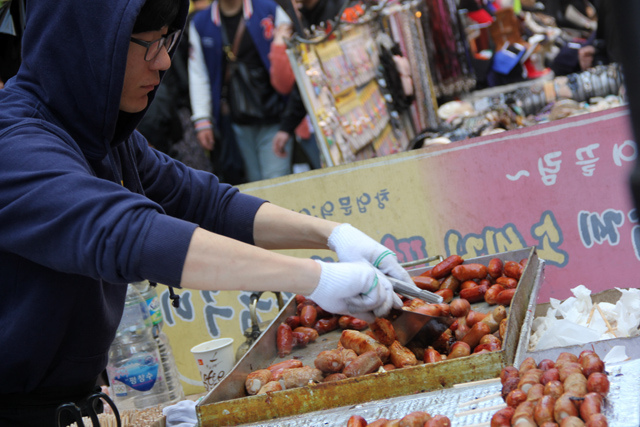 South Koreans have more than an obsession with hot dogs. These lardy bite sized hot dogs were stuffed with a variety of things, some were wrapped in bacon, and they were cooked in their own grease and then skewered to be served. I didn’t even try these, but from observing the smiling faces of those who indulged, they must be quite delicious. Deep fried dumplings are almost always delightful. These things are a little like Korean street food samosas, tasty filling with a crunchy outer layer. These deep fried dumplings are served straight out of the oil so they’re extremely hot. They are place in a little cup and you sort of eat it like an ice cream cone. 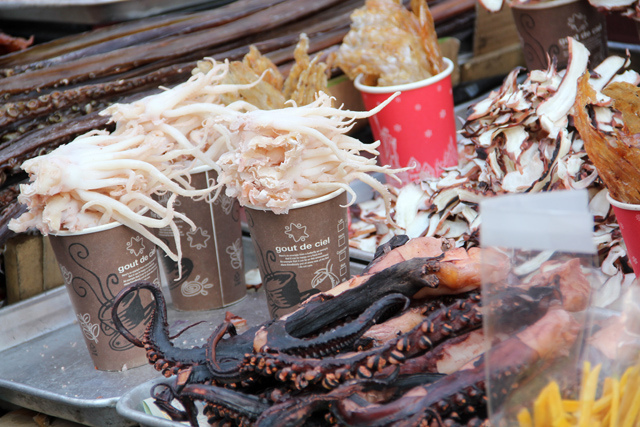 Seoul street food would just not be the same without tentacles of fried and dried octopus and squid. They really are some of the most delightfully flavorful and pleasingly textural item from the sea. 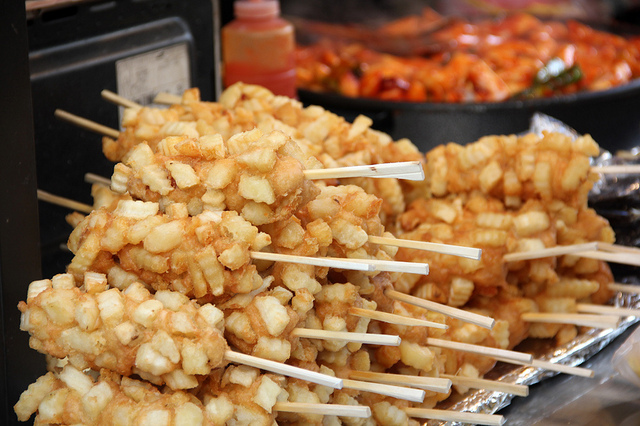 Seoul street food carts tend to carry a variety of different of different squid and octopus to satisfy whatever you craving happens to be. I could snack on this stuff all day! Here’s another closer shot of the octopus candy cart. If you’ve ever had tako in Hawaii, you’ll surely love the smoked octopus – YUM! Korean blood sausage is such a wonderful thing! This South Korean dish may not be for everyone, but those who indulge in the finer pleasures of blood sausage will be delighted with Korean soondae. Mixed with sticky rice or transparent noodles, I thought the Korean version was fluffy, spongy, and packed with lovely piggy flavor. They also threw some sliced lungs on top! 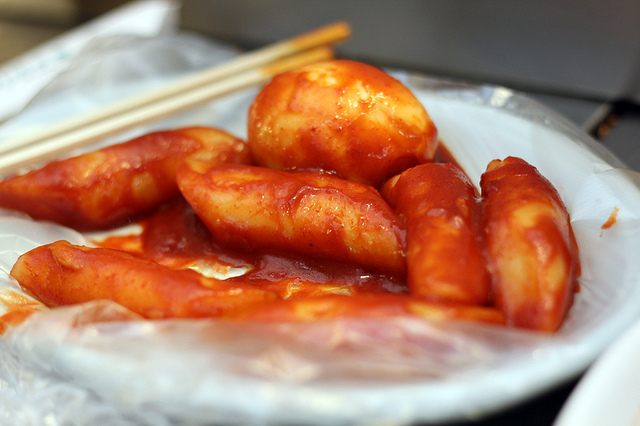 One of the staple Korean street food dishes is known as tteokbokki. From the moment you step into any busy place in Seoul, it’s impossible to not notice these bright red rice cakes smoldering away like hot lava. Every country has an iconic street food delicious, for Sri Lankan food it’s kottu, in Burma it’s laphet thohk, and for Korea it’s TTEOKBOKKI! The chunks of rice cake are similar to chewy gnocchi, and when cooked, they are coated in the ever present addictive Korean red sauce. Don’t worry, these rice cakes often look a lot spicier than they are. They not that spicy, but they sure are flavorful! 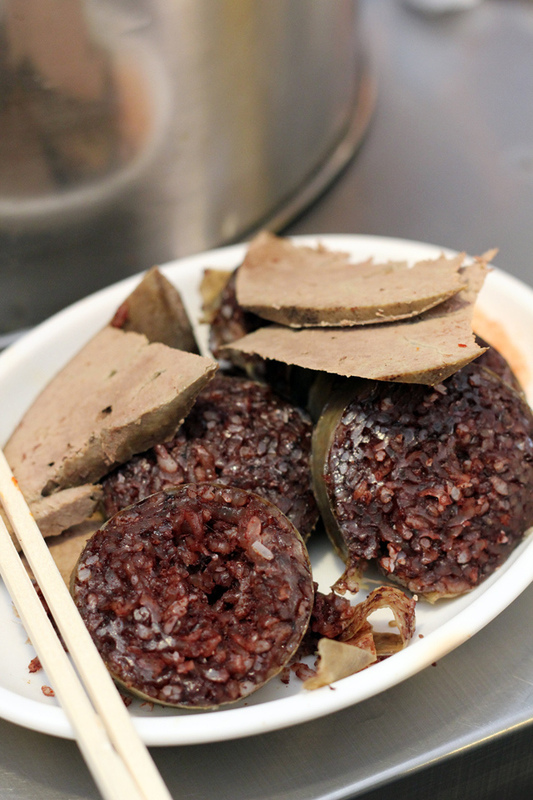 Here’s a close up shot of the blood red rice cakes – this one I ate even came with a hard boiled egg. Eaten on the street, you may be serve on a plastic wrapped plate. If they weren’t so overly huge, I never would have been temped to eat it… but since they were, it was inevitable. The breading was decent, though it wasn’t overly fresh, but the pudding itself with rather plasticy – not very good. 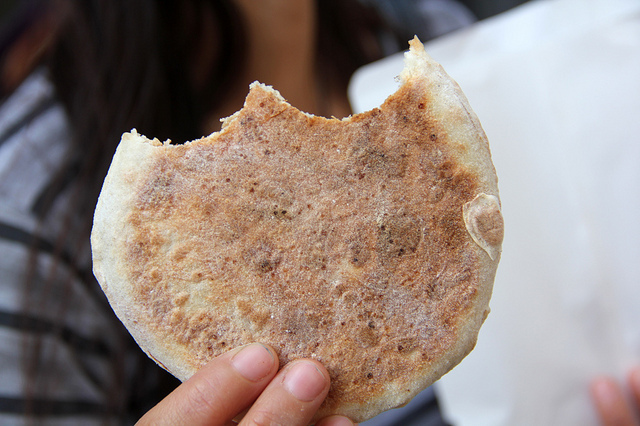 Similar to an Egyptian diet bread, this cracker like piece of Korean pita was filled with a very light sweet filling that just barely coated the inner edges. 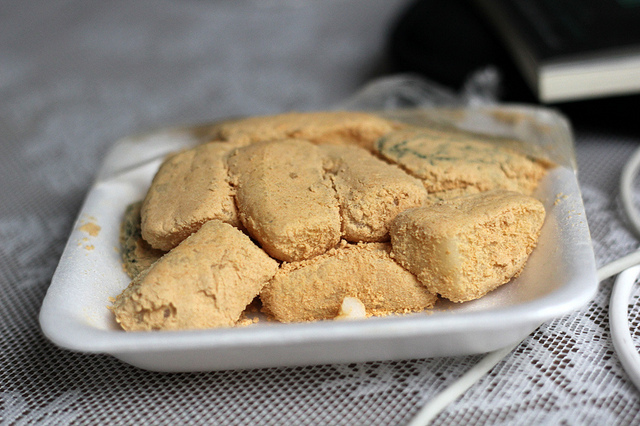 It was plain yet delightful, the type of snack that would be excellent with a cup of sweet Vietnamese coffee. While I did LOVE nearly every single Korean street food I sampled in Seoul, this plate of soft mochi rice wasn’t a winner. Perhaps I was imagining something fluffy and lightly sweet, brushed with powdered sugar. Nope, these were dry completely non sweet at all and I nearly choked on the powder. Have you ever had this? A lot of the sweet Korean desserts I sampled were stuffed with sweet red beans – and that’s a good thing. These soft mochi rice balls were delicious because they weren’t overly sweet and the entire balls were pillow soft. 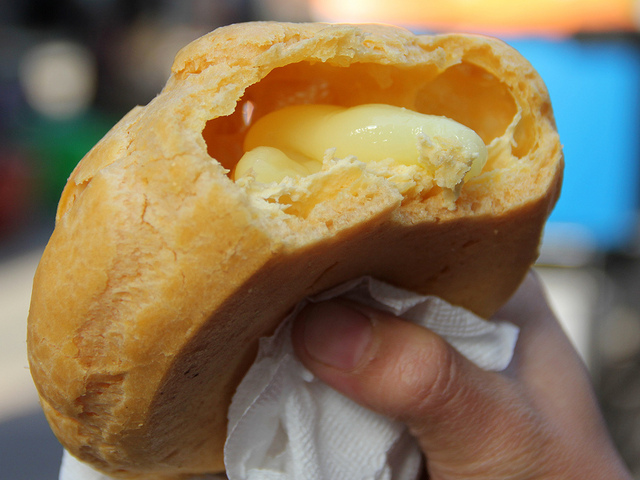 Similar to a Chinese steamed bun (baozi), this was a delicious little street snack in the Namdaemun market. 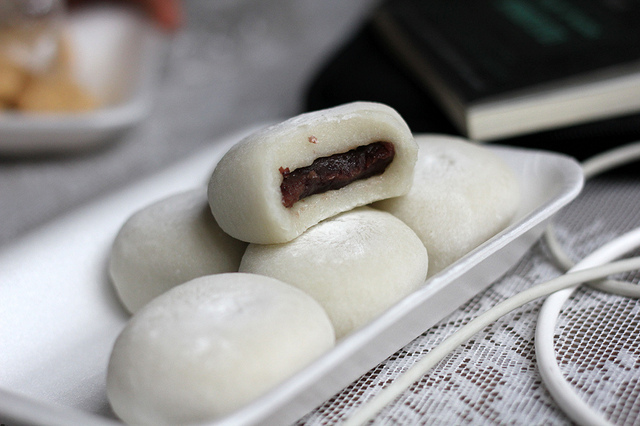 Lightly sweetened red bean paste packed into a flattened dough and steamed so the bread was soft yet lightly sticky. Something I noticed is that lots of Korean snacks are shaped into the form of fish. Not sure completely why, but I think it’s a fantastic idea! 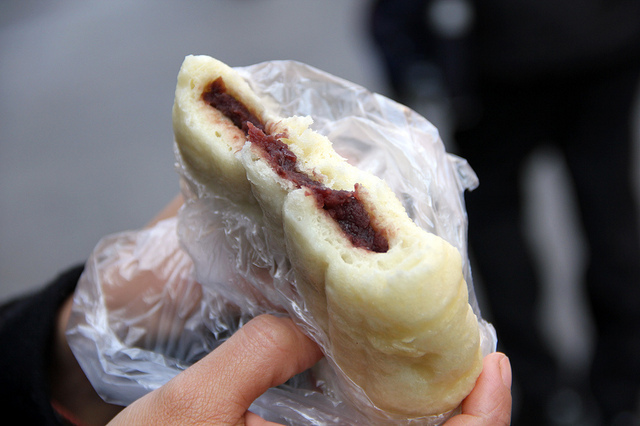 While the famous Korean fish snacks are made with a pancake batter, this particular version was just two pieces of toast filled with sweet red bean paste and pressed together in a hot mold. Koreans love their ice cream… And Korean ice cream is really really good. Even the packages of ice cream at 7-Eleven, things like Melona bars, are extremely delicious. 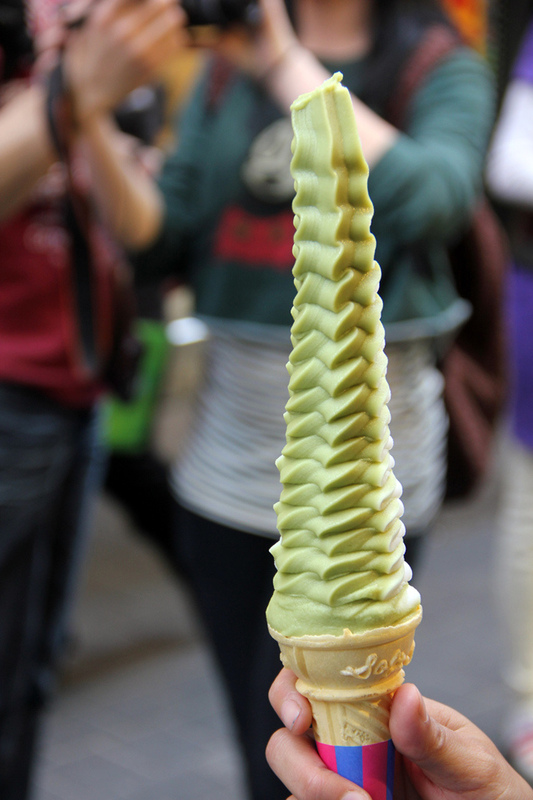 This rather famous ice cream cone located in Myeongdong is about as impressive as ice cream cones come. This small handheld cone was piled high with about a foot of ice cream on top. There’s a quick roundup of some of the tastiest Korean street food dishes I was able to eat in my short 2 week visit to Seoul. I wasn’t able to try everything as there was so much to eat, and prices were a little higher than I had imagined, but I did manage to fill myself and thoroughly enjoy eating my way through Seoul. In case you missed it, make sure you take a look at last weeks South Korean food article, for a roundup of Korean sit-down restaurant food. You don’t want to miss these dishes either!